Gross Area: 280,000 sq. ft.
Area Per Student: 175 sq. ft.
As one of the world’s leading premium schools organizations, Nord Anglia Education has been incredibly successful in the training of their students' critical thinking and multidiscipline problem solving within an International Baccalaureate program and STEAM-centered curriculum. With the new British International School of Houston (BISH), Nord Anglia sought to create a holistic flagship campus to deliver exceptional education through collaboration with organizations such as MIT and The Julliard School. BISH is their largest PK-12 school to date. Nord Anglia set out to utilize a “Schools within a School” composition to deliver a diverse curriculum that educates the whole student. 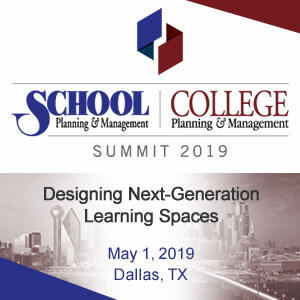 Their goal was to provide specialized areas that foster early learning through college preparation to support students at all phases of development. The school also needed spaces to support programs in collaboration with premium educational organizations such as MIT and The Julliard School to deliver a comprehensive global curriculum. 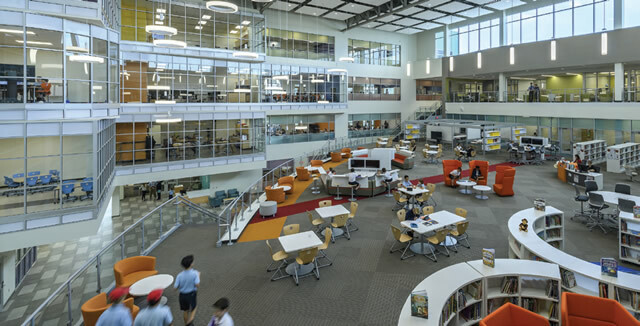 To meet these learning goals, Nord Anglia envisioned a hyper-transparent and connected environment with an aesthetic that mirrored their curriculum: premium and contemporary. From its inception, BISH was planned completely around the students and their learning needs, and personalized learning was woven into every design decision. Academic neighborhoods with individual identities were conceived to provide a sense of place for students within the large school. To deliver a holistic campus, the neighborhoods were designed around a four-story central atrium that connects academic, athletics and art-focused spaces to educate the whole student. The bar was set high designing a school for one of the world’s leading premium schools organizations, but Nord Anglia’s ambitious vision for the pedagogy and program offerings of BISH set the bar even higher. 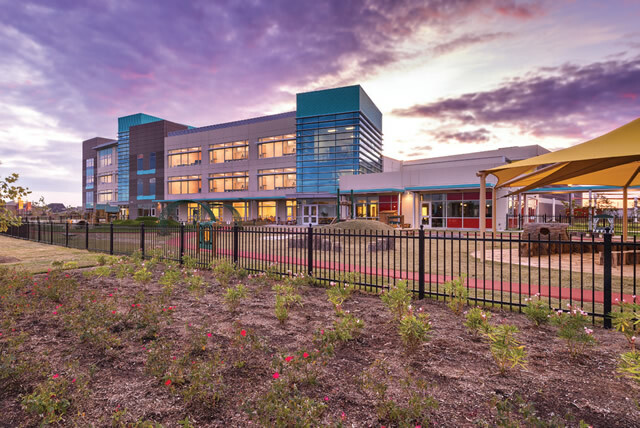 To meet their educational goals, the school was designed to be divided into academic neighborhoods that connect through a central core of specialized classrooms. Located in a transparent central column, these classrooms are the jewel box of the school’s science, technology, engineering, arts and math (STEAM) program. The grouping of maker spaces, science laboratories and a technology center defines the curriculum of the school. 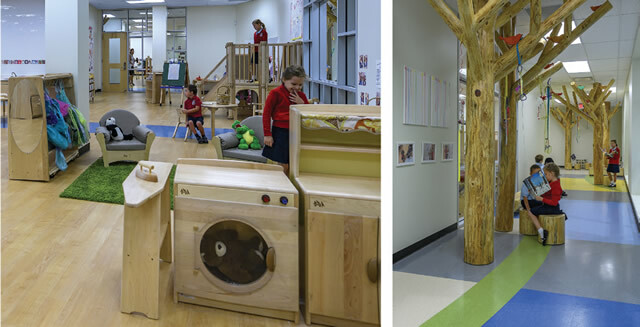 In addition to STEAM, collaboration and hands-on learning spaces deliver Nord Anglia’s vision to educate the whole student, while early learning and International Baccalaureate programs support learners in all phases of development. As Nord Anglia Education’s largest PK-12 campus worldwide, a special challenge of BISH was connecting a campus of this magnitude. To deliver on Nord Anglia’s vision, the design team dreamt up the Agora, a second-floor research commons in the atrium to serve architecturally and philosophically as the hub of the school. Part library and part living room, the Agora is the town square for learning activities and also serves as a tool for wayfinding. The rest of the school is designed around the Agora, and the extensive use of glass in surrounding classrooms creates a transparent, connected campus environment. 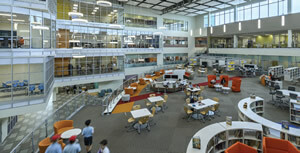 While the school is designed around the Agora, many individual spaces and elements of the campus also embody its design. Academic neighborhoods share this same arrangement. In each, central collaboration space is flanked by multiple classrooms allowing students to flow from one activity to another. Another example is the frame around the state-of-the-art, 500-seat auditorium in the BISH Performing Arts Center. The stage frame is designed as a reinterpretation of the atrium, keeping theming consistent throughout. The Performing Arts Center also features a theater, black-box theater, choral rooms, dance studios and keyboard- and strings-instrument laboratories. These spaces support programs in partnership with The Julliard School, the world-renowned performing arts conservatory. Another unique feature of BISH is that 50 percent of all wall surfaces have glazing, even in the academic neighborhoods. This design strategy further enhances transparency and connects students with each other and the surrounding community, emphasizing their global curriculum. BISH’s use of glass is also a safety component, as the school’s transparency allows instructors to see into classrooms and monitor students even when they’re not in the room. A secure entry vestibule at the entrance of the school allows staff to monitor who enters the building at all times and vet visitors before granting them access. This keeps students and instructors safe, and gives the community peace of mind. Glass is also used extensively throughout the school as part of its energy-efficient design. Strategic daylighting takes advantage of the Houston sunlight and significantly reduces the school’s need for artificial lighting. Because of this, most of BISH’s classrooms don’t require lights to be turned on at all during the day. 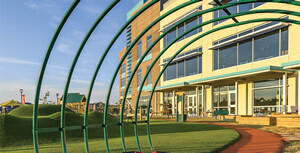 All exterior glass is insulated and double-pane to create a more energy-efficient facility. While modern, visually-interesting and expressive of Nord Anglia’s premium and contemporary aesthetic, the exterior of the school is also a function of economics. Tilt wall was used during construction to be cost-effective, with metal panel-clad stair towers to add variation to the exterior. Glass was used widely throughout the building for transparency, connectivity, safety and energy efficiency. One of the gymnasiums of BISH even features a recycled rubber flooring material. Outdoor sports fields, recreation and play areas on the campus of BISH are customized to further fulfill their vision of educating the whole child. A highlight of the site is the early learning playground which features outdoor gardens, exploratory spaces, gathering areas, hills and a bicycle track. The site allows young students to explore, play and experience nature in a way that stimulates their senses and imagination. BISH was built to be a “smart” building and designed with materials that require very little maintenance. Tilt wall was used to keep costs down, and all bleachers were cast in place making them easier to maintain. From glass walls to LVT flooring to LED lights, maintenance of BISH is easy and cost-effective, making it green and easy to clean! Construction of BISH had a fast-track schedule that required the general contractor to come up with some innovative methods of delivery. Tilt wall was utilized throughout the campus as a function of economics, but also as a way to improve the schedule. Students of BISH now have a dynamic new partner in learning—their building. Since opening in 2016, teachers and students have praised the campus, with Principal Andrew Derry calling BISH, “The most pedagogically-advanced school building in the world." The campus has hosted a variety of learning festivals, science fairs and experiments, Active Planet volcano modeling, band competitions, student-run businesses, performances and international celebrations all within the first year of school. BISH's global curriculum is supported and enhanced by every facet of the building's design giving students everything they need to collaborate, experiment and dream in an innovative, flexible and diverse environment. Good collaborative learning spaces. Resembles high-ed facility which is great for the upper-grade students. School’s transparency allows instructors to see into classrooms and monitor students.